103 was built for a short mining road in the heart of the copper range on the Keweenaw Peninsula in Lake Superior. After about ten years the mines and the railway ceased operation. The coach came to Manitoba and joined locomotive No. 3 on the short line from Lac du Bonnet, Manitoba to a new isolated hydro generating station at Point du Bois, the first of a series of stations on the Winnipeg River. There they served together until 1962 when a road was built. The number 103 was assigned to this coach by the Keweenaw Central at the time of purchase and it has never been changed. 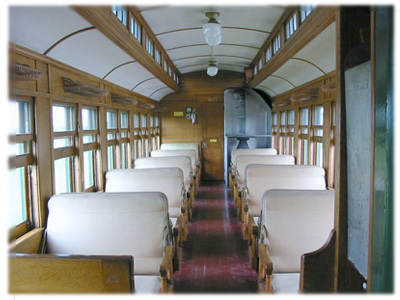 In fact, its colour scheme is unchanged and has been applied to the whole train. Coach 103 and Locomotive No. 3 began operating together in 1920 as the only locomotive and only coach on the Hydro line. They have been together ever since, making it a ‘marriage’ of over ninety years! Does anyone know of any other equipment partnership on any railroad that comes close to that record? The existence of French place names like Lac du Bonnet and Pointe du Bois recalls that the initial exploration and settlement of this area back in the late 18th century was carried out by fur traders from Montreal who used the Winnipeg River as a major access route. These roots are well remembered in the vibrant local Franco-Manitoban and Métis communities.